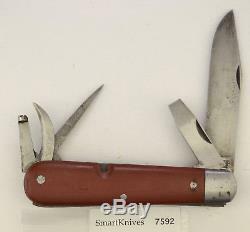 MODEL DESCRIPTION: T he Original Soldier Swiss Army knife was standard issue for Swiss soldiers from 1908 until 1949. 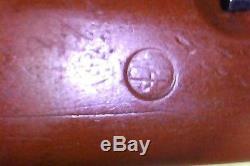 During this period, the Soldier was produced in equal quantities by Victorinox (usually labeled Elsener Schwyz) and Wenger (usually labeled Wenger Delemont). It was a hefty knife with plain carbon steel blades. Knives of this era often have pitting, and a black patina from oxidation. The snap is fierce, made for rugged mountain folks with strong fingers. You may need to use pliers to open the tools. The 1940 Soldier knife is 100mm (3 1/2") long, 25mm (1") wide, and 18mm (0.72) thick. It weighs about 121.7 grams (4.3 oz). And contains the following tools. This link has more about our used knife grades. 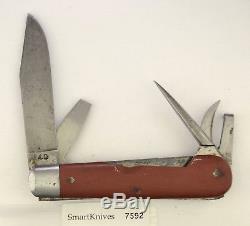 The item "Victorinox 1940 Swiss Army Soldier knife- used, Elsener Schwyz vintage #7592" is in sale since Monday, November 26, 2018. This item is in the category "Collectibles\Knives, Swords & Blades\Collectible Folding Knives\Modern Folding Knives\Factory Manufactured".